With battle of ballots for the Uttar Pradesh assembly entering the last phase, the focus of all political parties has shifted to the holy city of Varanasi, the Lok Sabha constituency of Prime Minister Narendra Modi. 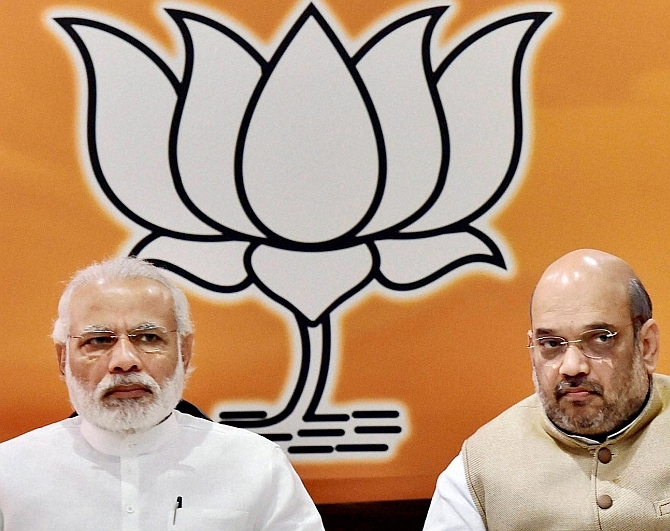 The saffron party which has a lot at stake in the last two phases of polling scheduled for March 4 and 8 has moved its war room to Varanasi, entrusting Union ministers and senior leaders with the task of strengthening the campaign with the prime minister in the vanguard. The BJP is also faced with the target of quelling resentment in certain quarters over senior leaders being denied party ticket in these elections. The importance of the area comprising 89 constituencies, which go to polls in 14 districts of on March 4 and 8, is strengthened by the fact that the prime minister is scheduled to address public meetings in Jaunpur, Mirzapur and Varanasi on March 3, 4 and 5, respectively. Following in the footsteps of the BJP is the SP-Congress combine which has also shifted its focus to Varanasi and its campaign strategist Prashant Kishor and his team members are busy crafting Varanasi area-specific strategy. Taking the BJP and PM head on, the SP-Congress has launched a "Dard-e-Banaras" campaign highlighting the disillusionment among the electorate over Modi's "false promises and no delivery". Team PK has launched three videos of less than two-minute each which are played from the campaign raths or video vans around Varanasi. Kishor claims that till date they have reached about 2,00,000 Facebook and Whatsapp users around Varanasi within a span of just a couple of days. The volunteers of the team are also holding door-to-door campaign armed with publicity materials and personal letters from Chief Minister Akhilesh Yadav and street plays. Central leaders are holding press conferences to keep the pot boiling till the D-day. The team of Akhilesh and Rahul are also likely to hold a road show in Varanasi on March 4 and senior leaders of both the parties are camping there to oversee their strategy in the face of the moves by the saffron party. BJP president Amit Shah has been in constant touch with partymen, making frequent trips and over the past week, he stayed back in Varanasi for five nights fine-tuning the strategy with Union ministers and party leaders. According to BJP, this is the first time that the party has set up a new media centre near Chawka Ghat in Varanasi, where at least one Union minister addressed mediapersons every day to highlight achievements of the Modi government, the party's manifesto. The minister also targets the Akhilesh government, its alliance with Congress, and the BSP. Moreover, the party has set up a war room at its headquarters in Kashi region in Gulab Bagh area, where party workers have been assigned the task of publicising BJP programmes through social media. A protocol cell has been set up to look after arrangements for Union ministers visiting Varanasi, while a separate 'Awas Vibhag' (housing cell) has been formed to manage accommodation for visiting BJP leaders. Over the past week, Union ministers who have visited Varanasi include Rajnath Singh, J P Nadda, Ravi Shankar Prasad, Kalraj Mishra, Uma Bharti, Ananth Kumar, Smriti Irani, Narendra Singh Tomar, Piyush Goyal, Mahendra Nath Pandey, Santosh Gangwar, Krishna Raj and Anupriya Patel. BSP chief Mayawati is also touring these constituencies addressing three to four election rallies a day while leaders of her party have been assigned the task of staying in contact with the electorate at the grassroots level.